Love hearts - Do You Remember? One of the most nostalgically remembered sweets from my (and probably yours too) childhood was the always amusing Love Hearts. They were sold in round tubes, with approximately 20 sweets in every packet, each one adorned with a heart shape which framed a central message. These ranged in tone from the casual ‘Stay cool’ and ‘Smile’ to the romantic ‘I like/love you’ and ‘Ever Yours’ via the rude (‘Dream On’), the naughty (‘Tease Me’) and the slightly bizarre (‘Tickle Monster’). 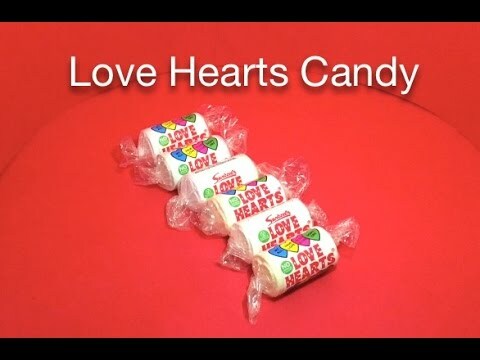 Forget Tinder or Match.com, if you were a child in the 1980s then Love Hearts sweets were the only tool you needed to see if you and your true love were meant to be. If the object of your affection offered you one of the slightly sharp tasting little circles with something positive written on, like ‘Be Mine’ or ‘For Keeps’ on then you were in. If however, the sweet you received said something like ‘Good Pals’ or, even worse, ‘Hard Luck’ then all you could do is retreat to a hidden part of the school playground and try to stop your tears dripping onto your rah-rah skirt. The most romantic of all the messages was, of course, ‘Marry Me’ and if you Google something along the lines of ‘proposals using love heart sweets’ then you’ll see it certainly did its job – if they’re all to be believed then there are many happy couples who are now Mr and Mrs because of a little piece of candy. Several special versions have been made, including ones that celebrated Lady Diana and Prince Charles’ marriage in 1981 and ones personalised for Wayne and Coleen Rooney’s wedding in 2008 (personalised ones are also available for ‘normal’ people through the Love Hearts website). If you’re a One Direction fan then you’ll be pleased to know that you can also get their own branded Love Hearts, featuring messages such as ‘I Love Louis’, ‘Always Niall’, ‘Liam Rocks’, ‘Zayn 4 Me’ (although you’ll have to chuck these out now he’s left) and ‘Harry 4 U’. The adult shop Ann Summers also does its own range, but that is definitely not one I’ll be discussing here. Love Hearts are made by Swizzels Matlow; a company that has been around in one form or another since 1928, when brothers Alfred and Maurice Matlow opened a jelly sweet making factory in Canning Town, East London. Five years later the pair merged with a second sweet business so that they could share a larger factory in Plaistow, also in East London. Swizzels, who were manufacturing fizzy little compacted tablet type sweets at this time, became Swizzels Matlow Ltd. They were responsible, later in the 1930s, for creating Rainbow Drops: packets of sugar-coated puffs of maize and rice which promised so much when you bought them, sitting there looking all inviting in their pretty multi-coloured coats, until you realised they actually rice tasted like very stale Rice Krispies. The 1940s brought the Blitz to London and the company left for New Mills in Derbyshire, originally intended just to be for the duration of the war but in the end it became a permanent move. Alongside their sweets (of which food rationing limited their production for a while) the factory also produced water purifying tablets for the Ministry of Defence. Later on that decade Swizzels Matlow introduced Parma Violets, the small, round, purple discs that always taste to me faintly of a great aunt. But it was in 1954 that Love Hearts first made an appearance, albeit as the prize in a cracker in the first instance. Only one message was printed on those original sweets: ‘I Love You’ but when they started being produced for the mainstream market then more variety was added. Unfortunately some didn’t make it: ‘Hello Mum’ (fair enough - you weren’t going to share these with your parents, were you?) and, criminally, ‘Hey Daddio’. Later additions try to move with the times….there was once ‘Page Me’ and ‘Fax Me’ (because that’s how all young people communicated isn’t it?) and you can now get ‘Skype Me’, ‘Tweet Me’ and ‘Take a Selfie’ as well as the more regional ‘Alreet Pet’ and ‘Cwtch Me’ (watch Gavin and Stacey if you don’t understand that last one). The most up-to-date range has six different colour hearts, each with their own flavour. White tastes vaguely like vanilla, yellow is a tangy lemon, green is a not-too-sharp lime, orange is orange, obviously, purple is a sort of scented berry flavour (not unlike Parma Violets) and red has a slight cherry essence. Love Hearts have now been around for over 60 years; an enduring playground favourite that will continue due to the fact that children will never tire of offering the sweets to friends and then giggling at the message written on them. Swizzels Matlow are also responsible for several other after-school treats, including Refreshers, Drumstick lollies, Fruity Pop lollies and the fab Double Lollies (two different flavours on the top and the bottom). I have a slight confession now; Love Hearts were never a particular favourite of mine (I much preferred spending my pennies on a Dip Dab or a handful of Mojos) but I am sad that I never got to sample another similar sweet, modelled on Love Hearts, that was launched by Swizzles Matlow in the 1960s. It’s one that I consider to be the finest educational use of confectionary ever: ‘Golf Hints’. These included a message too, a handy golf tip on each one. Not so romantic, true, but a damn sight more helpful if you were fond of whacking a small ball with a big club. Do You Remember Love hearts? There was a footy version for the boys, you got a sticker with a div. 1 badge on it. I think these caused me heartburn! I loved these as a kid and now my 4 yr old daughter loves them too...not many sweeties like em that can stand the test of time! I still have these too. I love them so much my mum bought me to coffee mugs with love heart lollies printed on them. Kinda sad I know. Yes brilliant for heartburn.Our local shops sell them.